Whois added to station editor | America loves Sporks! ← What if Premiere Radio shuts down? 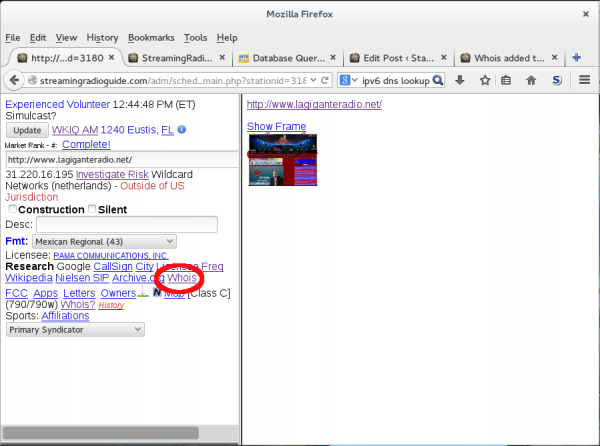 For those doing station verification, a new link has been added to click to do a “Whois” query. Since I’m not asking you to do research until you’ve had significant experience, this new feature is mainly here for my use (and the curious among you). To get a web site visible, there are three different things that have to be done. In many cases, the same company provides all of them, but not always. The first is the Domain Registration. The domain registration process assigns exclusive use to a domain name on the internet – not only web servers, but email and other things you probably don’t want to know about. The process also provides a mechanism for resolving disputes where more than one person claims the same or similar names, or the name is a trademark. If I were to try to register Xerox.info, Xerox’s lawyers would challenge the registration and win. The second thing you need is a web server on the internet, which is connected to the internet by someone who provides internet services and a path to reach the server. The current “investigate risk” link is telling you that information – which provides clues like server is located somewhere other than where you would expect (like Japan or Switzerland). It doesn’t mean there is an actual risk, but there is reason for being careful. The third thing you need is a DNS resolver service. It’s the glue that holds the first two together. 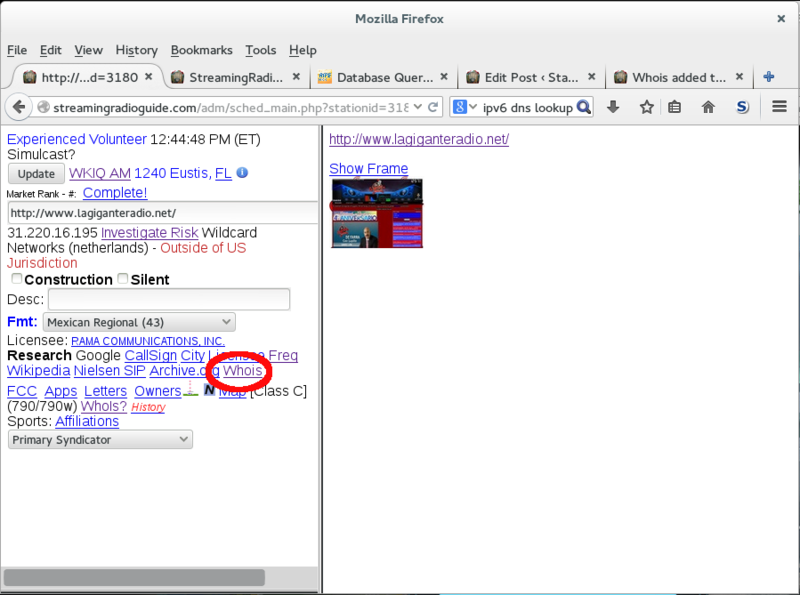 StreamingRadioGuide.com is registered, and the server is located at address 50.116.19.46. When you try to access the server, first the domain is looked up to find out where to find the server. You will see that the domain is owned by me, and ENOM is the registrar (that’s the company in Chicago that used to house the web site). It tells you that my DNS lookup service is provided by EasyDNS, a company I switched to when ENOM’s DNS service failed and my business was losing $100s an hour because of it (back in the FindAnISP.com days). EasyDNS is located in Toronto, Canada. So let’s say you’re trying to figure out if http://www.lagiganteradio.net/ is really the website for WKIQ-AM (1240) in Eustis Florida, airing the Regional Mexican music format (The Big One). Registration Service Provided By: SOLO10.COM S.A. So the Domain Registrar is in Europe, DNS Server is located in Spain (Espana), and the “Owner” of the domain is an individual named Javier Sanchez who lives in Guadalajara, Mexico. The actual server is located in Manchester, England – the connection hops on some fiber cable in Northern Virginia (near the CIA) to get to Amsterdam in the the Netherlands, then over to England on a connection run by the Nippon Telephone and Telegraph. So with all that information, is this the real web site or a fake copy? Probably time to answer my own question.